YO! Sushi has transformed the concept of Japanese food and has created a revolutionary and unique dining experience. Conveyor belts filled with a rainbow of coloured plates carrying mouth-watering food prepared by chefs cooking in front of the diner have made sushi fun, funky and totally accessible. YO! Sushi: The Japanese Cookbook brings YO!’s delicious Japanese dishes to the home and shows you how easy it is to make your own sushi and other Japanese fare. This eye-popping book includes YO!’s most popular dishes: california rolls, salmon maki, prawn yaki soba and chilled roasted aubergines. Original recipes encourage readers to expand their repertoire and enjoy a range of flavoursome dishes. Learn to cook soy-marinated chicken, make healthy salads such as beetroot with sweet vinegar and impress friends with red snapper rice. 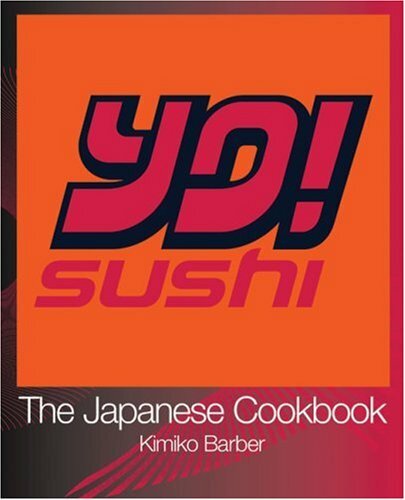 Written by renowned Japanese food expert, Kimiko Barber, YO! Sushi: The Japanese Cookbook includes 120 delicious recipes. Forget complicated rolling or bizarrely named ingredients, Kimiko explains all the terms and shows how to make sushi rolls and other dishes through step-by-step photography. No recipe takes more than 30 minutes preparation or requires special cooking techniques. The book is divided into six colour-coded sections which reflect YO!s famous coloured plates, taking the reader chapter by chapter from novice to samurai so that you can work your way up the rungs until you’re rolling with gusto. The book is fully illustrated in YO! Sushi’s exuberant style: Crisp finished food photography, bright graphics, and atmospheric reportage shots bring the energy of the YO! experience to the reader.